A famous painting of St. Francis of Assisi by the Italian painter Caravaggio is on loan at the Detroit Institute of Arts until January. Fra Ljubo je rođen 3. listopada 1958. u Otoku kod Vinkovaca. Osnovnu školu završio je u Posušju, a Franjevačku klasičnu gimnaziju u Visokom. U Franjevački red stupio je 15. srpnja 1977. na Humcu. Filozofsko-teološki studij pohađao je u Sarajevu, Zagrebu i Jeruzalemu, gdje je postigao i akademski stupanj magistra teologije na Studium Biblicum Franciscanum (1987.). U Ameriku je stigao 16. travnja 1987., te je iste godine imenovan župnikom župe Sv. Marka u Sudburyju. Na toj župi ostaje 8 godina, do imenovanja župnikom župe Sv. Nikole Tavelića u Montrealu (1995.). U rujnu 2001. godine fra Ljubo preuzima dvije župe u Sudburyju: sv. Marka i Presvetoga Trojstva, a od 2006. godine župnik je u Windsoru. The most important activity of the Franciscans in the United States and Canada has been their pastoral work in the parishes. 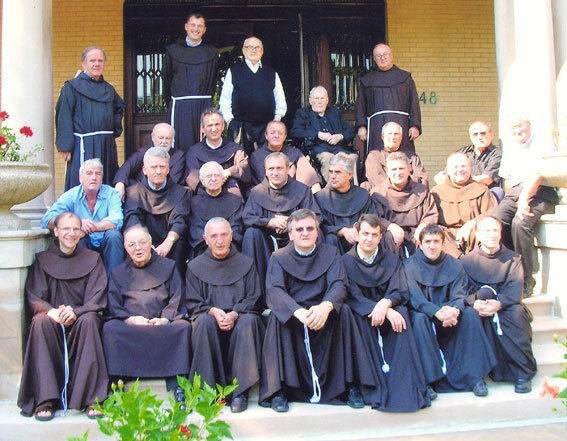 Many parishes were established by the Franciscans; others were accepted because other religious communities or dioceses did not have enough priests to continue serving these parishes. Fr. Steve was born November 25, 1953 in Kobilić near Karlovac, Croatia. He completed grade school in Kamensko near Karlovac and on June 17, 1966 came to St. Louis, Missouri. He graduated from high school at St. Joseph’s Seminary, Oak Brook, Illinois. In 1981 he entered the Franciscan novitiate in Green Bay, Wisconsin. He continued his studies at the Catholic Theological Union in Chicago where he graduated with a Masters in Divinity. He was ordained a priest at Sacred Heart Church in Chicago on May 10, 1985. He served as associate pastor at St. Augustine’s in West Allis, (1985 to 1989), administrator at Sacred Heart, Milwaukee (1989) and associate pastor at Sacred Heart, Chicago (1989-1994). From 1994 to 2000, he served as pastor of Sacred Heart, Milwaukee, returning to Sacred Heart in Chicago that summer where he currently serves as pastor. Fr. Stephen was also on the Custodial Board from 1988 to 1991. Fr. Ante was born November 12, 1973 in Mrkodol in the county of Bukovica. He attended grammar school in Mrkodol and Brisnik, and high school from 1992 to 1994 in Sinj and from 1994 to 1995 in Humac. On July 15, 1995, Fr. Ante entered the Franciscan noviciate in Humac. He completed his studies in theology in Zagreb in 2001. He was ordained a deacon in Zagreb on Oct. 27, 2001, and made his vows of priesthood June 29, 2002. Since then until September 2003 Fr. lived in the Franciscan Monastery in Humac, and then left to serve as assistant pastor at St. Cyril and Methodius parish in New York. In June 2006 he started serving at Sacred Heart Parish in South Chicago as a vicar. In October of 2008, Fr. Ante was assigned as temporary assistant pastor at St. Joseph Croatian Parish in St. Louis and served there until February 2009, when he left for Croatia to seek a working visa in Canada. In October of 2009, he arrived at the Queen of Peace Croatian Parish in Norval, Canada, and in December of 2009 returned to the Province in Mostar. Fra Jozo was born July 27, 1947 in Bukovica near Tomislavgrad. He graduated grade school in Posusje and continued his studies at the Franciscan high school in Visoko. He finished his theological studies in Freiburg, Germany in 1974. That same year on May 19 he was ordained a priest. Fr. Jozo arrived in the USA on Sept. 19, 1975 and immediately pursued his study of the English language in Chicago and Washington. He became assistant pastor at St. Mary’s in Steelton (1976-1980). At that time he was transferred to St. Jerome Parish, Chicago as associate pastor. He became pastor of St. Jerome’s in Detroit where he stayed until 1989. He was then named pastor of St. Mary’s in Steelton until 1995 when the diocesan clergy assumed the ministry in the Steelton parish. Fr. Jozo then was named pastor at St. Francis in Windsor, and in 2006 he became pastor in Troy, Michigan where he presides today. Fr. Jozo served on the Custodial Board twice (1979-1982 and 1993-1997). Fr. Larry, as he is known by the majority of his Franciscan brothers, was born November 28, 1938 in Pittsburgh, Pa. where he completed his high school education. He then continued his studies in Westmont, Il., entered the novitiate in Teutopolis, Il. in 1958, and then completed his philosophical studies in Cleveland, Ohio. He completed his theological studies in Teutopolis, Il. and was ordained a priest on January 9, 1966. Fr. Larry was Director of Spiritual Activities at Our Lady of Peace Friary in Beaver Falls from 1966 until 1969. He continued his post- graduate studies at Notre Dame University during the summer months and received a Master of Arts in Liturgical Studies in 1968. The next year he was named superior of St. Francis Friary in Gulf Breeze for one year. During that year he taught religion at the local Catholic high school and served as a civilian auxiliary chaplain at the nearby Air Force Bases. He next served as associate pastor at Sacred Heart Parish in Milwaukee (1970-1977). During that time he pursued further graduate studies at Marquette University and received his doctoral degree in Historical Theology in 1976. The following year he lectured at the same university. Then for one year he was pastor of St. Anthony’s Parish in Sharon. He then assumed a teaching position for seven years at Kansas Newman College in Wichita, KS. He was appointed pastor of St. Joseph’s Parish in Bethlehem in 1985, and during his nine years there he taught at both Allentown College of St. Frances de Sales and Mary Immaculate Seminary. He became pastor of St. Augustine’s Parish in West Allis in 1994 and remained there until 1999. He then assumed a teaching position in theology at St. Joseph’s Seminary in Yonkers (Dunwoodie), N.Y., the major seminary for the Archdiocese of New York. Fr. Larry served on the Custodial Board for three terms (1973-1976, 1988-1991, 2000-2003). He worked with Fr. Timothy Majić in preparing the Golden Jubilee Book for the 50th Anniversary of the Custody in 1976. He has published a number of articles in the following magazines: The Homiletic and Pastoral Review, Liturgy, The Priest and The Dunwoodie Review. Since September 2000, he serves as pastor of St. Augustine parish in West Allis, and in 2006 he was named pastor again. Fr. Joe was born in Ljubotići, parish Kočerin, Herzegovina January 27, 1941. He graduated high school at Siroki Brijeg after completing grade school in his hometown. He went on to graduate from the Dominican school on the island of Bra?. He joined the Franciscan Order in 1959 and was ordained a priest on July 10, 1966 after completing his studies in philosophy and theology in Sarajevo. Fr. Joe arrived in the United States in 1967 and studied the English language in Washington, D.C. He was assigned to Mother of God Parish, a Slovenian Parish, in Waukegan, Il for a short while. He was assistant pastor in the following parishes: St. Augustine, West Allis (1968-1974); St. Anthony’s Sharon (1974) and St. Mary’s in Rankin (1974-1976). He then was appointed pastor at St. Augustine’s Parish in West Allis (1976-1986). His next assignment was pastor of Sacred Heart in Milwaukee where he stayed for 3 years. In 1989 he was named pastor at St. Jerome’s in Detroit, At this parish Fr. Joe undertook the task of moving the parish to a better location, building a new church, hall, rectory and large parking lot. The parish was given a new name, St. Lucy. Here he stayed until 1997 when he was named Pastor to St. Joseph’s in Bethlehem. Fr. Joe was on Custodial Board twice (1976-1979, 2000-2003) and President of the Croatian Civic Club in Milwaukee, WI. He became guardian of St. Anthony’s Friary in Chicago from April 2005. Fr. Robert was born July 4, 1942 in Harrisburg, Pa. He entered the Franciscan Order in 1959 at Lake Geneva, Wi. He completed his studies at West Chicago, Il where on Dec 22, 1969 he became a priest. After his ordination he was sent to St. Francis Friary in Gulf Breeze where he assisted in the pastoral duties at the nearby Air Force Bases. In 1971 he was assigned as assistant pastor at St. Anthony’s Parish in Sharon. That same year he went to Wheaton, Il. where he taught religion at St. Francis High School. He stayed in Wheaton until 1974 when he was transferred to Our Lady of Peace Friary in Beaver Falls. where he again taught at Quigley High School until 1978. He then served as assistant pastor of Sacred Heart in Milwaukee (1986-1987). He then was assigned as pastor at St. Anthony’s in Sharon (1987-1989), Holy Trinity in Ambridge (1989-1994) and St. Joseph’s in Bethlehem (1994-1997). For 2 years he was in chaplaincy work at St. Francis Hospital in Greenville, SC (1997-1998). He served as pastor at St. Augustine’s in West Allis from 1999-2000. He served at Custodial Board for one term (1985-1988). Since 2002, he serves as assistant pastor at St. Joseph parish St. Louis. Fr. Jozo was born in Rama, Bosnia-Herzegovina on March 17, 1966. As a child his family moved to Pozega, Slavonia, where he completed his first 12 years of schooling. He joined the Franciscan Order in 1986 in Humac. Fr. Grbes studied philosophy and theology at colleges in Sarajevo, Canterbury and London, England where he graduated in 1992. He arrived in the United States on October 2, 1992 and was ordained a priest on February 7, 1993 at SS. Cyril and Methodius Parish in New York. He continued his pastoral duties in the same parish after his ordination while taking post-graduate courses at St. John’s University where he received a Master’s Degree in theology. In 1996 he was transferred to St. Jerome’s in Chicago as assistant pastor. He was St. Jerome’s pastor from 2001 to 2012. He continued his post-graduate work in pastoral theology at the Catholic Theological Union in Chicago. In January 2013, Fr. Jozo became Custos of the Croatian Franciscans of USA and Canada, of the Croatian Franciscan Custody of Holy Family. Fr. Miro was born March 5, 1956 in Posuski Gradac, Herzegovina. He completed his schooling in Visoko at the Franciscan high school. Fr. Miro was received into the Franciscan Order in 1977 at Humac. He continued his theological studies in Makarska and Augsburg where he was ordained a priest on June 30, 1985. He came to the USA on Dec. 13, 1986 and was assigned as asociate pastor at St. Francis Parish, Windsor. Fr. Grubisić in 1987 was sent to Washington D.C. to pursue skills in the English language. He served as assistant pastor at SS. Cyril and Methodius in New York (1988-1989), Our Lady of Peace, Norval 19 89-1991), SS. Cyril and Methodius, New York (1991), Holy Trinity, Ambridge (1992) and St. Jerome’s, Chicago (1993-1994). In 1994, Fr. Miro was appointed pastor at St. Leopold Mandić Parish in London-St. Thomas, Canada. From 2001-2003, Fr. Miro was assistant pastor of Queen of Peace parish in Norval, and from May 2003, he was serving as pastor of St. Nicholas Tavelic in Montreal. From July 2004, he is serving as pastor in Kitchener. Fr. Jozo was born February 20, 1949 in Sovići, Herzegovina.He completed high school in Split and joined the Franciscan Order in 1971 in Humac. He studied theology in Sarajevo, Zagreb and then in Washington, D.C. after his arrival to the United States in May of 1975. Fr. Jozo was ordained a priest on September 3, 1977 in Chicago. He was assistant pastor at St. Anthony Parish in Sharon(1978-1980), St. Mary’s in Steelton (1980-1982). In 1982 he was appointed pastor at St. Leopold Mandić Parish in London, Ontario, where he held that position until 1989. He then served as assistant pastors at SS. Cyril and Methodius in New York and St. Francis, Windsor (1989-1991). He was named pastor at Holy Family in Kitchener (1991-1997) and then St. Jerome’s in Chicago, from 1997 to 2001. Fr. Jozo was a member of the Custodial Board (1997-2000). From 2001 to 2004, Fr. Jozo served as pastor of St. Leopold Mandic in London, and since then as a pastor in Montreal. Fr. Robert was born in Kongora near Tomislavgrad on April 14, 1967. After completion of grade school he was accepted to the Franciscan high school in Visoko. He joined the Franciscan Order in 1986 in Humac. He continued his studies in philosophy and theology in Sarajevo, Zagreb and graduated with a bachelor’s degree in theology from the University of Graz, Austria. Fr. Robert was ordained a priest in 1994 in Tomislavgrad. His pastoral duties included St. Michael Parish in Tomislavgrad (1994-1995) and then Assumption in Posusje (1995-1997). After his arrival in the United States Fr. Robert resided at Sacred Heart Parish and St. Jerome’s Parish in Chicago (1997-1998) after which he was appointed assistant pastor at SS. Cyril and Methodius in New York. In September 2001, Fr. Robert returned to Croatia where he currently seves as assistant pastor in the parishes of Saborski and Plaski. He is author of three books: Zupa Kongora (1993), Posuski zbornik (1996) and Ljetopis posuski (1998). Fr. Ljubo was born in Čitluk, Herzegovina on March 18, 1938. He completed his high school in Visoko and continued to study philosophy and theology in Sarajevo, Zagreb and Rome. He joined the Franciscan Order in 1957 in Kraljeva Sutjeska. His ordination took place in Siroki Brijeg on August 2, 1964 where he spent the next year. He then spent 4 years in Switzerland organizing a Croatian Mission from 1967-1971. Fr. Ljubo studied moral theology at the Alphonsianum in Rome from 1971-1974 He arrived in the United States in 1974 and began his pastoral duties as associate pastor SS.Cyril and Methodius in New York. The following year Fr. Ljubo was named Director of the Croatian Ethnic Institute in Chicago. He returned to Mostar in 1976 to work with students. He returned to the United States and was Director of the Croatian Ethnic Institute in Chicago (1977-1980) and at the same time assisted at St. Jerome’s parish in Chicago. Fr. Ljubo was the pastor at St. Mark’s in Sudbury (1980-1987) and then pastor and director of Our Lady of Peace Center in Norval (1987-1995). He then returned to Chicago to once again accept the position of Director of the Croatian Ethnic Institute and editor-in-chief of the Croatian Almanac. Fr. Krasić is the author of the book Die Schulung der Kinder verschiedener Nationalitäten aus Jugoslawien in den europäischen Ländern, co-author of Croatian Language I and II, Croatians in the Sudbury Centennial and Ilustrirani rječnik za djecu: hrvatski-engleski-njemački-francuski. Fr. Zvonimir was born January 2, 1939 in Prisoje near Tomislavgrad where he finished grade school and graduated high school in Visoko. He joined the Franciscan Order in 1959 in Kraljeva Sutjeska. He studied philosophy and theology in Sarajevo and Ljubljana. Fr. Zvonimir was ordained on July 10, 1967 in Sarajevo. He immigrated to the United States in 1967 and spent some time in Dayton, Ohio. He was associate pastor at St. Mary’s Parish in Steelton (1968-1971) and at Sacred Heart in Chicago (1971-1976). Fr. Zvonimir was then named pastor at St. Francis in Windsor (1976-1995). where he built a new church, hall and rectory. He was then pastor at St. Jerome’s in Chicago (1995-1997). Since 1997 he has been pastor at Holy Family in Kitchener, and since July 2004 in London. On two different occasions he was on the Custodial Board (1979-1982; 1982-1985). Fr. Veselko was born January 12, 1961 in Podkraj, parish Kočerin, Herzegovina. He completed high school in Siroki Brijeg. He joined the Franciscan Order in Humac in 1981. He studied philosophy and theology in Makarska, Jerusalem and Sarajevo. His ordination took place on June 29, 1988 in Mostar. That same year he arrived in the United States where he served as assistant pastor at Our Lady of Peace in Norval (1988-1989), St. Augustine’s West Allis (1989), SS. Cyril and Methodius, New York (1989-1991) and at St. Jerome’s Chicago (1992). In 1991 he also attended Georgetown University to study English. Fr. Veselko was appointed pastor of Our Lady of the Highways Parish in Sault Ste. Marie in 1994 where he resides today. In 1999 he also assumed the duties of pastor at Immaculate Conception parish in nearby Garden River, Ontario. Fr. Ljubo was born in Otok near Vinkovci October 3, 1958. He completed grade school in Posusje and then went on the Franciscan high school in Visoko. He joined the FranciscanOrder on July 15, 1977 in Humac. Hi completed his philosophical and theological studies in Sarajevo, Zagreb and Jerusalem where he earned a Master’s degree at the Studium Biblicum Franciscanum (1987). He immigrated to the US on April 16, 1987 and was appointed pastor at St. Mark’s in Sudbury, Canada. He stayed there for 8 years until his appointment as pastor at St. Nikola Tavelić in Montreal, Canada in 1995. In September 2001, Fr. Ljubo takes on the leadership roll in both Croatian parishes in Sudbury, St. Mark and Holy Trinity.Since 2006, Fr. Ljubo serves in Windsor. Fr. Timothy was born in Vitina, Herzegovina January 9, 1914 where he also completed grade school. He went on to complete high school in Siroki Brijeg and joined the Franciscan Order in 1933 at Humac. He was ordained on June 4, 1939 in Mostar after completing his philosophy and theological studies both in Mostar and Rome. In 1941 he departed his homeland for Germany to study at the University of Freiburg. During his studies he continued his pastoral ministry among the Slovenian and Croatian people in many German towns. At the University of Freiburg he earned two doctorates: one in philosophy (1946) and one in theology (1951). Fr. Majić immigrated to the United States on March 22, 1951. Shortly thereafter he was named editor-in-chief of the outstanding newspaper Danica and held the position for 10 years. He then went on to become assistant pastor at St. Joseph, St. Louis (1961-1963) and SS . Cyril & Methodius, New York (1963-1967). He was then appointed pastor of Sacred Heart in Milwaukee (1967-1979). While in Milwaukee he was also Custos of the community (1973-1976). After his years in Milwaukee he returned to St. Anthony’s Friary in Chicago as editor-in-chief of the Danica (1979-1988) and then as guardian (1988-1994). He then was the editor-in-chief of two worthy periodicals: Croatian Catholic Messenger and Croatian Almanac (1994-1996). Fr. Timothy now resides at the friary in Chicago. Fr. Majić was on Custodial Board twice (1967-1970 and 1976-1979). He, together with Fr. Lawrence Frankovich, prepared the Golden Jubilee Book for the 50th Anniversary of the Custody in 1976. He was also the secretary of the Association of Croatian Priests in America and Canada for 20 years and editor of the periodical Vinculum Caritatis of the same association. Fr. Ivica was born in Imotski, completed grade school in Drinovci and then went on to finish high school in Visoko and Sinj. He joined the Franciscan Order in 1993 in Humac. Fr. Ivica completed his philosophical and theological studies at Catholic Theological University in Zagreb in 1999. He immigrated to the United States on November 17, 1999 and served as a deacon at St. Jerome’s Parish in Chicago where he was ordained a priest on May 7, 2000. From September 2000 to September 2001, Fr. Ivica served as assistant pastor of St. Francis Parish in Windsor. From there he departed to New York to serve in the same capacity at St. Cyril and Methodius Parish. In June 2002, he was named administrator of that parish and since mid-2003 served as its pastor. In August 2006, he came back to Chicago as pastor of the Blessed A. Stepinac Mission on the north side of Chicago. In January 2013, Fr. Ivica became Pastor of St. Jerome Croatian Parish in Chicago. Fr. Paul was born on August 25, 1937 in Ljubljenica, Herzegovina. He departed as a child to Austria (1945-1947) and then to Italy where he completed grade school in Grottomare. He started high school there, and he graduated from St. Joseph’s Seminary in Westmont, Il. after arriving in the US in 1951. He entered the Franciscan Order in 1955 at Lafayette, New Jersey. Fr. Paul continued his studies Rye Beach, New Hampshire, St. Bonaventure University, N.Y. and completed his theological studies at Holy Name College in Washington, D.C. where he was ordained a priest on March 17, 1962. Immediately after his ordination he was appointed assistant pastor at Sacred Heart Parish, Chicago (1962-1964) and then at Sacred Heart in Milwaukee (1964-1970). He then served as pastor in the following parishes: St. Joseph in St. Louis (1970-1976), St. Jerome, Chicago (1976-1979), Blessed Trinity, Ambridge (1979-1982) and at Sacred Heart, Chicago (1995-2000). In September 2000, he became pastor of Sacred Heart in Milwaukee where he served until 2012. In January 2013, Fr. Paul became Pastor of Blessed Aloysius Stepinac Mission in Chicago. Other than his parish assignments, Fr. Paul held the positions of superior at Our Lady of Peace Friary in Beaver Falls (1979), and guardian at St. Anthony Friary in Chicago (1982-1985 and 1994-1995). He was Custos of the Custody for three terms (1985-1994). During that time Fr. Paul initiated and edited the Custodial Newsletter. He has been the Director of the Croatian Franciscan Printery in Chicago since 1982 to its closing, and since 1990 has been the Spiritual Director of the Croatian Catholic Union. He has also been on the Custodial Board three times (1970-1973, 1982-1985 and 1997-2000). He served as a Custos of the Franciscan Custody again, from 2009 to 2012. Fr. Slaven was born in Ljubuski, Herzegovina on March 29, 1965. He completed his grade school in Ljubuski and then went on to Visoko where he attended high school.l. He received the Franciscan habit in 1983 in Humac. Fr. Slaven studied theology in Sarajevo, Makarska and Bologna, Italy. He was ordained in Fulda, Germany on June 23, 1991. The following three years he spent as assistant pastor at SS. Peter and Paul in Mostar (1991-1993) and at St. Katherine in Grude (1993-1994). He arrived in the United States on September 18, 1994 and proceeded to Washington, D.C. to study English. Fr. Slaven was appointed assistant pastor at Our Lady of Peace in Norval (1995-1997) and then was appointed pastor of St. Lucy’s Parish in Troy until 2000. The following two years he served as pastor of St. Cyril and Methodius in New York. From May 2002 to June 2003 he resided at St. Anthony Custody in Chicago. He then returned to the Homeland and is currently serving as vicar in St. Nicholas Tavelic in Tomislavgrad. Fr. Stjepan was born 1948 in Drinovci, Herzegovina where he completed grade school. He then continued his schooling in Visoko and studied philosophy and theology in Sarajevo and Würzburg, Germany. He entered the Franciscan Order in 1970 in Humac and was ordained June 29, 1975 in Rome. His pastoral work in his homeland was as assistant pastor included Blessed Trinity in Blagaj (1975-1978), St. Paskal in Vitina (1978-1981) and SS. Peter and Paul in Mostar (1981-1982). After his arrival in the US he was appointed assistant pastor at SS . Cyril and Methodius, New York (1982-1984), St. Mary’s in Steelton (1984-1985) and Sacred Heart in Chicago (1985-1987). In 1987 he was named pastor of St. Nikola Tavelić in Montreal where he stayed until 1995. Then he was transferred to Our Lady of Peace Center in Norval where he was pastor from 1995 to 2009. In 2010, he became pastor of St. Joseph Parish in St. Louis, MO. He was on the Custodial Board three terms (1985-1994, 2001-). Fr. Nikola was born in Suica near Tomislavgrad on November 6, 1971 where he graduated grade school. He graduated high school after attending the schools in Visoko and Dubrovnik. He entered the Franciscan Order in 1991 at Humac. Fr. Nikola studied philosophy and theology at the Institute of the Society of Jesus in Zagreb where he was also ordained on June 17, 1998. That same year he came to the United States and was named associate pastor of Our Lady of Peace Center in Norval. From September 2000 to September 2001, Fr. Nikola served as assistant pastor at Sacred Heart parish in Chicago. Since then to 2006, he was pastor of St. Lucy’s in Troy, and since 2006 he is serving in New York. Father Philip was born May 12, 1930 in Waterloo, Iowa where he completed parochial grammar school in 1944, followed by high school and junior college at St Joseph Minor seminary Westmont IL. He entered the Franciscan Order July 4, 1950 in Teutopolis IL as a member of the Sacred Heart Province. He completed his philosophy studies in Cleveland in 1954, followed by four years of theology in Teutopolis IL and.was ordained June 24, 1957. He served as assistant novice master, spiritual director and master of clerics till 1967. He did supplementary study in clinical psychology at Loyola University and then served as associate pastor at Our Lady of Angels in Cleveland from 1969-1972 and at Sacred Heart Indianapolis from 1972-1975. While serving in the Custody of the Holy Land in Jerusalem, Jaffa and Tiberias from 1975-1986 he also did two years of supplementary biblical study in Jerusalem. He then transferred to our Croatian Custody in 1986 and served in Medjugorje as confessor and pilgrim assistant from 1987-2000. Since then he resides at our St. Anthony Friary in Chicago where he helps with seasonal supply in some of our Croatian parishes and also continues with occasional pilgrimage assistance to Europe and the Holy Land. Fr. Ilija was born in Kamena, Herzegovina on July 26, 1941, Fr. Ilija completed grade school in his home town and then finished high at the Franciscan Seminary in Visoko. His completed his studies of philosophy and theology in Sarajevo. He was ordained a priest on July 26, 1969 in Frohnleiten, Austria. That same year he arrived in the United States and studied English at Dayton, Ohio. Fr. Ilija became assistant pastor at St. Mary’s in Steelton where he spent five years. He then went to Assumption Parish in Thunder Bay and became their first pastor (1976-1980). After this he was appointed pastor at St. Leopold Mandić in London, Ontario (1980-1982), St. Anthony’s in Sharon (1982-1984), Sacred Heart in Milwaukee (associate pastor 1984-1985, pastor 1985-1986), SS . Cyril and Methodius in New York (1986-1989) and St. Leopold Mandic in London, Ontario (1989-1994). For a short period of time he was at Sacred Heart in Chicago after which he was named pastor of St. Mark’s in Sudbury in 1995 where he served until 2001. For the next two years he was pastor of St. Nicolas Tavelic Parish in Montreal. In May 2003, he returned to Sudbury where he serves today as assistant pastor for St. Mark’s and Trinity parishes. Fr. Marko was born October 3, 1954 in Vranjevići, Herzegovina. There he finished grammar school, and he completed his high school education at the seminary in Visokom. He entered the Franciscan Order in 1973 in Humac. He studied philosophy and theology in Sarajevo and Augsburg, Germany where he graduated and was ordained a priest on August 9, 1981. He first served at the parish of SS.. Peter and Paul in Mostar (1981-1983). On March 23, 1983 he came to the United States and was named assistant pastor of SS. Cyril and Methodius in New York (1983-1989). He was appointed pastor at Sacred Heart Parish in Milwaukee (1989-1994), and in 1994 he was appointed pastor at SS. Cyril and Methodius Parish in New York where he was serving until September 2000. He then became pastor of St. Lucy’s in Troy, Michigan. In July 2001, he was chosen as Custos of the Franciscan Custody, which function he held to 2009. Fr. Marko also served on Custodial Board for four terms (1988-1997 & 2000-2003). He was also the editor of the Custodial Newsletter. In 2009, Fr. Marko became pastor of the Croatian Franciscan Centre “Queen of Peace” in Norval, Canada. Fr. Tomislav was born September 22, 1974 in Kamena, parish Blagaj in Herzegovina. He finished grammar school in Blagaj and completed his high school education at the seminaries in Visoko and Sinj. He entered the Franciscan Order in 1993 in Humac. He completed his philosophy and theological studies at the Catholic Theological University in Zagreb in 1999. He came to the United States on August 24, 1999 and served as deacon at St. Lucy’s Parish in Troy. He was ordained for priesthood on May 7, 2000 at St. Jerome’s Parish in Chicago, and was named its associate pastor in August 2001. He also served for a short time (September 2000 – August 2001) as assistant pastor at Queen of Peace Parish in Norval. In August 2004 he returned back to homeland. Fr. Stipe was born on September 5, 1978 in Livno. He completed grammar school in Sesvetski Kraljevec, and archdiocesan classical high school in Zagreb. He adorned the Franciscan habit in Medjugorje on September 8, 1996 and spent his year in the novitiate in Humac near Ljubuski. He completed theological studies at the Catholic University in Zagreb, and was ordained deacon on Nov. 30, 2002. He arrived in the United States ion the fall of 2002 and served as deacon in St. Cyril and Methodius in New York. Fr. Stipe received the sacrament of holy orders at Sacred Heart in Chicago on May 21, 2003. Until 2005, he served as assistant pastor of Queen of Peace parish in Norval, and since February 2005 he served as assistant pastor in New York. After that, Fr. Stipe became assistant pastor of Sacred Heart Parish in Milwaukee, and since January 2013, he is assistant pastor at St. Jerome Croatian Church in Chicago. Fr. Jago was born on June 7, 1968 in Sidney, Australia and there completed his grammar school education. Fr. Jago and his family moved to Canada in 1983. His high school education was completed in London, Ontario, and he entered the Franciscan Order in 1987 in Humac. His studied philosophy and theology in Makarska and Assisi. He was ordained a priest on July 10, 1994 in Tomislavgrad. After his ordination he did pastoral work at St. Anthony’s in Humac. He came to the United States in 1996, and he has served as associate pastor at several parishes: Sacred Heart in Chicago (1996-1997), Queen of Peace in Norval (1997-1998) and St. Francis in Windsor since 1998. In 2000, Fr. Jago was sent to the Holy Land Custody in Jerusalem where he resides today. F r. Slavko was born on November 20, 1946 in Medjugorje, Herzegovina. He finished grammar school there and completed his high school education in Dubrovnik. He entered the Franciscan Order in 1966 in Humac. Fr. Slavko studied philosophy and theology in Sarajevo, Trent and Rome. He was ordained a priest in Königstein, Germany on June 29, 1972. He came to the United States on October 10, 1973. After studying English for a few months, Fr. Slavko began his pastoral work. He spent some time as associate pastor at several parishes: St. Augustine’s in West Allis (1974-1975), SS. Cyril and Methodius in New York (1975-1977) and St. Jerome’s in Chicago (1977-1979). He was named pastor at several parishes: SS. Cyril and Methodius in New York (1979-1986), St. Augustine’s in West Allis (1986-1988), St. Mary’s in Steelton (1988-1989) and once again SS. Cyril and Methodius in New York (1989-1994). While in West Allis, Fr. Slavko established the Catholic radio program in 1987, and in New York he founded the Croatian Franciscan Emergency Relief Fund which aided the war victims in Croatia. He was Custos of the Custody from 1994 to June 2001 when he was named Provincial of the Franciscan order based in Herzegovina. He serves in Mostar where the headquarter is located. Fr. Slavko was on Custodial Board from 1985 to 1988. Fr. Ivan Strmecki was born December 21, 1957 in Pittsburgh, Pennsylvania, but grew up in Madison, Wisconsin, where he attended grammar school, high school, and graduated from the University of Wisconsin at Madison with a B.A. in Physics and Mathematics. Following that, he earned a Master’s Degree in Science from Cornell University, in Ithaca, N.Y., and then a Master’s Degree in Journalism from the University of Wisconsin at Madison. He was received into the Croatian Franciscan Custody of the Holy Family in 1999, studied Theology at the Catholic Theological Union in Hyde Park, earning a Master of Divinity Degree. Father Ivan was ordained a priest on May 31, 2005 at Sacred Heart Church in Chicago. From 2002 to 2005, he lived and served at Sacred Heart Parish in Chicago. From September 2005 to 2012, Fr. Ivan served at St. Jerome Parish in Chicago as an associate pastor. In January 2013, Fr. Ivan became pastor of Sacred Heart Parish in Milwaukee. A Special Thank You to St. Jerome Catholic Church for Providing me all the above information via their web site. Sunday Mass: 8, 10:30 A.M.
Week day: 7:30 A.M. and 6:00 P.M.
Sunday Mass: 7:30, 9:30 and 11:00 A.M. Weekdays: 8:00 A.M. and 6:00 P.M.